Visit the Yamaha website for more information. Rockaway Music is an authorized Yamaha dealer in Northern and Central New Jersey offering the full line of traditional Yamaha Grand and Upright Pianos, the latest Yamaha Disklavier Player Pianos, Clavinova Digital Pianos, Yamaha Silent Pianos and AvantGrand Hybrid Pianos. No dealer can offer more in terms of Yamaha piano models, cabinets, finishes or advanced technology. The Yamaha reputation is built on over a century-long tradition of uncompromising care and craftsmanship, supported by an unmatched level of manufacturing expertise, top-of-the-line production facilities and an exceptionally skilled, knowledgeable and dedicated workforce. Important Warning: Due to Yamaha's incredible popularity, many, if not most dealers use the internet to imply they are "Authorized Yamaha Dealers", or can somehow deliver "New Yamaha Pianos." Do not believe it. Please verify with Yamaha that the dealer of your choice is in reality, an "Authorized Yamaha Dealer." Please review the document on "Gray Market" Japanese Pianos. Seiler is one of Europes most prominent piano manufacturers. Since 1849, the goal of the company has been to achieve perfection. Every genuine Seiler piano embodies the know-how and experience of four generations of highly skilled piano builders. 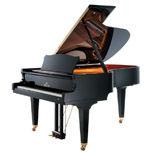 Seiler grand and upright pianos are far more than just top quality instruments. They are all unique and masterful works of art. As a result, Seiler has earned a worldwide reputation for being the industry benchmark through its impeccable craftsmanship, quality, and precision. The Seiler piano company was founded in 1849 by Eduard Seiler and became one of Germany's foremost piano makers by the late 1800's. Seiler pianos have received awards in Moscow, Paris, Vienna, Amsterdam, Berlin and Milan for their clarity of sound, responsive touch and outstanding quality. By the early 1900's, Seiler established showrooms in Berlin, Breslau and London. During this time, Seiler pianos were also being utilized in the top educational institutions, such as the Royal Conservatory at Berlin and other leading universities and conservatories in Germany and abroad. After WWII, the Seiler factory relocated to the Bavarian town of Kitzingen and became a founding member of the 'German Pianos Quality Association.' During the late 1900's, Seiler acquired many patents such as the Membrator Soundboard and the Tonal Volume Stabilizer which are still being utilized in their pianos today. Most recently, the Seiler Family of Fine Pianos was expanded to include the Eduard Seiler Series and the Johannes Seiler Series. Today, the Seiler heritage of superior quality and craftsmanship continues into the 21st century. A new piano is a wonderful addition to your home or studio and the selection of a Samick piano is a wise decision. The beautiful tone, responsive touch and the timeless beauty of their cabinetry has made Samick the piano of choice. Established in 1958, Samick Music Corp. has over 50 years of experience manufacturing high quality pianos. The craftsmanship developed over these years has made Samick one of the largest and most knowledgeable producers of pianos in the world today. Samick is the first piano maker to achieve ISO 9002 certification. The quality of workmanship is evident when you look closely at the fit and finish of a Samick piano. The world-renowned German scale designer, Klaus Fenner has created these pianos with a warm European voice. By combining the finest materials and craftsmanship with his award winning scale designs, he has created a piano that will make beautiful music for generations to come. K. Gunner Benson's skill and experience in piano design is evident in the refined lines and curves that make these the most beautiful case styles available today. The finest veneers and case construction assures you that your Samick piano will hold its beauty and value for many years. 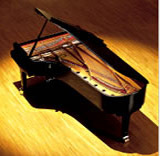 Samick pianos offer the pianist a great sounding and playing piano at a tremendous value. Whether you choose an upright or grand piano, with Samick you get the same great attention to detail and quality of materials. With proper care these instruments will last for many generations. 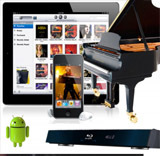 Visit the PianoDisc website for more information. Imagine your piano played by Rachmaninoff, Horowitz or Rubinstein, some of the world's greatest artists. Imagine it playing Broadway show tunes, classical, jazz improvisations or ragtime, all your favorite music. Imagine your piano setting the stage for every occasion from dinner for two to a house full of company. Imagine it playing the perfect musical selections as vividly as if the artists were performing them right before your eyes. That's PianoDisc. Stencil Pianos – Buyer Beware!